Professor Jamie Shulmeister, RGSQ past-President, 2017-2018 Council member and staff member at UQ School of Earth and Environmental Sciences, was a member of a team of researchers (Archaeologists and Anthropologists, Geographers, Social Scientists) led by Archaeologist Chris Clarkson investigating the human occupation of northern Australia. The time of arrival of people in Australia is an unresolved question which is relevant to debates about when modern humans first dispersed out of Africa and when their descendants incorporated genetic material from Neanderthals, Denisovans and possibly other hominins. Humans have also been implicated in the extinction of Australia’s megafauna. The research highlighted here was conducted at Madjedbebe, a rock shelter in Arnhem Land. The new excavations revealed artefacts including distinctive stone tool assemblages, grinding stones, ground ochres, reflective additives and ground-edge hatchet heads. The dating of these artefacts, and other analyses of the sediments, confirmed Indigenous Australian occupation at this site around 65,000 years ago. The evidence from this research project set a new minimum age for the arrival of humans in Australia, the dispersal of modern humans out of Africa, and the subsequent interactions of modern humans with Neanderthals and Denisovans. Jamie’s role was to evaluate the paleoclimatic evidence for the period around 65 ka to support whether human arrival was likely at that time. The research results were published in the prestigious journal Nature in July 2017. It was followed by another paper (lead author Archaeology PhD student, Kasih Norman) that looked at the likely routes of migration from Indonesia into Sahul (greater Australia including New Guinea) at 65 ka. Jamie worked with another geographer, Dan Harris (UQ) to determine seasonal current velocities and directions between Timor and Australia and in the Bird’s Head area of New Guinea. The work demonstrated that it would have been significantly easier to venture by boat from Timor to NW Australia than to enter Sahul via New Guinea. This work was published in Quaternary Science Reviews in January 2018. “Modeling modern human maritime migration pathways from Asia to Pleistocene Greater Australia”. Quaternary Science Reviews 180: 229-239 (January 2018). Mr Syd Kirkby has been awarded the Australian Honour of Officer of the Order of Australia (AO) in the 2018 Queens Birthday Honours List. 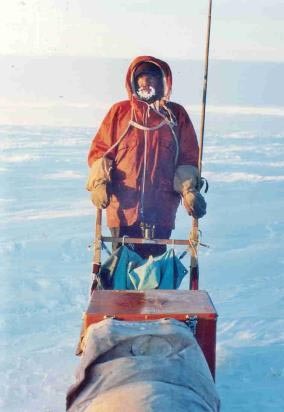 The award is in recognition of his 65-year career and his distinguished service to surveying and mapping in Australia, particularly in the Antarctic, to polar exploration, research and mapping expeditions, and to professional scientific societies. Courtesy of Syd Kirkby. On the left: observing at Rumdoodle Peak. On the right: sledging in the ‘60s. Sydney L. Kirkby, MBE, Polar Medal has been an active member of RGSQ and of the ANARE Club in Queensland since moving to Queensland in 1986 following his retirement from the Division of National Mapping, Melbourne office. 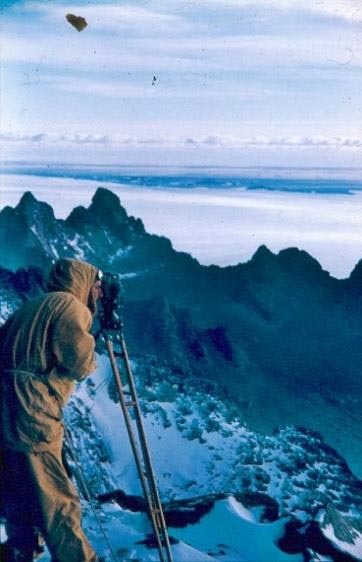 The fact that Syd has been involved in exploration of Antarctica from Cape Adare at 170°East, to the west of the Australian sector at 45°East, west of Enderby Land, and also inland to the Southern Prince Charles Mountains, is unique; while his management of Surveying and Mapping techniques for the extension of knowledge has become legendary. Syd has also led the way in communicating Antarctic Affairs to the community with his regular availability to speak at community organisations. As a Member of the Royal Geographical Society of Queensland, Syd Kirkby has been a popular contributor and lecturer. On one occasion, the lecture had to be repeated to satisfy the lack of space for those interested at the first presentation. In April 1993, Syd presented a major paper to the Royal Geographical Society of Queensland, titled “From Sledge dogs to Satellites”. This is published in the “Queensland Geographical Journal”, 4th Series, Volume 8, in 1993 and subsequently in the “Queensland Surveyor”, Volume 1998 Number 5, in October 1998. The exhibition “Our Frozen Frontier” was also supported by RGSQ and was opened in the RGSQ Auditorium (Brookes Street, Fortitude Valley) in 1997 - the key feature of this venture being the number of display venues over a period of six months: Brisbane (Geographical Society), Rockhampton, Longreach, Mount Isa, Townsville and then was mounted at Brisbane Museum for the month of November. At his Thomson Address in 2002, Syd Kirkby was presented with the RGSQ Thomson Medal. The award of Officer of the Order of Australia recognises Syd’s wide involvement with the community and his professional career. RGSQ congratulates Sydney Lorrimar KIRKBY on the receipt of the Award of Officer of the Order of Australia (AO). Dear Members, welcome to Brisbane’s winter! With days in the low-mid 20deg.C and nights usually 8-10 deg.C, we are, indeed, spared from really cold winters. To give our winter woollies an airing, my family recently had a brief sojourn in the Bunya Mountains, 200km or three hours’ drive north-west of Brisbane. We passed the impressive construction of the Toowoomba Second Range Crossing, a 41km-long toll bypass route, due for completion in late 2018. It will run from the Warrego Highway at Helidon in the east to the Gore Highway at Athol in the west. The final ascent to the Bunya Mountains National Park is via a steep, winding road. Upon arrival we were greeted by large mobs of red-necked wallabies grazing peacefully in the paddocks surrounding “Bunya village” - accommodation cottages, cafes and a well-stocked park shop. The Bunya Mts rise to 1100m, a unique elevated refuge of biodiversity surrounded by plains and cleared farmland. The mountains are the remains of a shield volcano active approximately 24 million years ago, and although there is no visible crater the broad shield shape can be visualised from the west. The biomes comprise wet and dry rainforest, open eucalypt forest, distinctive plant, animal and bird communities, including more than 30 rare and threatened species such as sooty owls, powerful owls and the black-breasted button quail. The Bunya Pine trees (Araucaria bidwillii) are the world’s largest remaining stand of these ancient flowering plants, having survived since Australia's Cretaceous and Jurassic environments (65–210 million years ago). Growing to a height of 50 metres or more, they tower above the rainforest along the range crest. 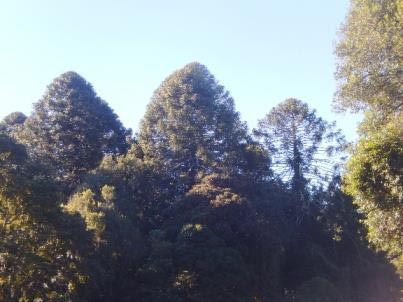 While the Bunya pines are protected today from direct human disturbance, it is unclear what effects climate change might have on these pre-historic survivors. 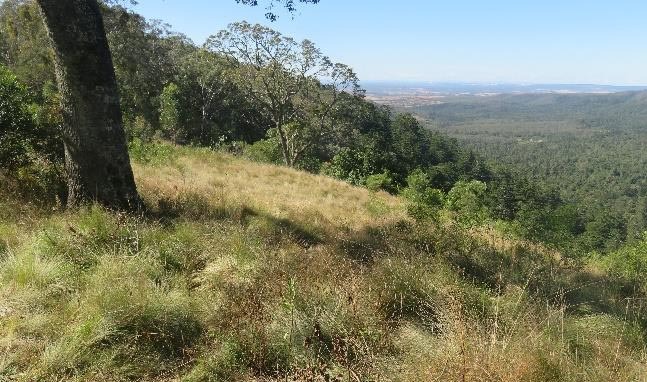 The intriguing Bunya Mountains balds support rare native grasslands, thought to be the result of firing by indigenous people, combined with drying of the climate and shallowness of soils. The balds are monitored closely as an endangered ecosystem threatened by invasion by woody plants (Willmott, 2004). Bunya Mts National Park is Queensland’s second oldest national park. In 1842, Governor Gipps had decreed that no logging licences be granted in lands bearing Bunya Pines, in recognition of their importance to Aboriginal people. In 1881, however, a timber reserve was declared for logging red cedar in the mountains. When the cedar was depleted loggers moved into the Hoop pine and Bunya stands. 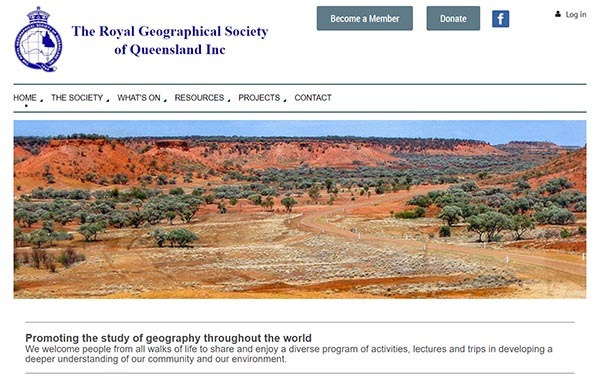 The Royal Geographical Society of Australasia, Queensland Branch (now RGSQ) played a role in lobbying for protection of the Bunyas against powerful timber and grazing interests. Despite national park status being declared in 1908, logging continued for some time. By the early 1930s, roads had replaced rough tracks to the mountain top and construction of walking tracks in 1939 heralded a new age of conservation and tourism. By the end of the 20th century many private houses and rental cottages had been built in the Dandabah area, the basis of today’s mountain tourism. Aboriginal Bunya Gatherings: The Wakka, Jarowair, Djaku-nde and Barrungam people have traditional custodianship of the Bunya Mountains. Every three years the Araucaria trees produce mature edible cones, which local indigenous people traditionally celebrated by holding Bunya Gatherings, sometimes lasting for several months. Tribes from all over Southeast Queensland were invited to enjoy ceremonies, renew friendships, pass on lore, share ideas and resolve disputes. Hunting of wildlife was strictly controlled during the gatherings. Protocols dictated who could harvest Bunya cones. The mature nuts were roasted and pounded into meal for cakes. European clearing for grazing and farming around the Bunya Mts in the 1840s and 1850s made it difficult to travel along traditional pathways and many Aboriginal people were forced to leave the Bunyas. The last great gathering was held in 1902 (Queensland Museum) but local indigenous people still maintain ties with the Bunyas through family, trading, songs and stories. There is a 2017 native title claim over part of the area. A “BIG THANK YOU” to the RGSQ members who helped and registered to help but were not required for the 2018 Question Pack mailout. What a mammoth effort in a tight working space! We used the downstairs Unit 2 at 237 Milton Road to do this mailout. A somewhat more confined venue compared to previous years, yet the team of volunteers were able to sort, pack and ship nearly four tonnes of printed material to 768 schools accounting for over 71,100 students. On Monday of Anzac Day week all printed materials and other required equipment arrived at RGSQ. Volunteers arrived promptly on Tuesday morning to start the packing process, and again on Thursday and Friday. Milton Post Office at Mary Ryan’s Bookshop picked up the packages for free and lodged them in the Australia Post system. We used Australia Post’s tracking numbers this year to allow tracking of parcels over 500g as we did for the 2017 Certificate mailout. While it adds a little more time in the process, it has been a great assistance in allowing the RGSQ Office to address school queries about delivery times. THANK YOU for doing the arduous work Ian Francis, Roger Grimley, James Hansen, Paul Lambert, Peter Lloyd, Patrick McKewin, Neville McManimm Peter Nunan, Ron Owen, Mike Piccolo, Kay and Graham Rees, Bob Reid, Sue Reid, Pamela Tonkin, and John Wilkinson. Early to mid-June - we would like to call on members to assist with the scanning of the returned answer sheets. At present no specific dates can be given as it depends on when and how many sheets are returned at any time. This job is very repetitive and requires concentration to ensure no mistakes. If you would like to help or enquire about the task, please call Bernard in the Society’s Office on 3368 2066. Tuesday 24 to Friday 27 July – we would like to again call on members to volunteer to help with the sorting, packing and dispatch of the Australian Geography Competition’s certificates, results and prizes. If you can assist with this mailout, please contact the Office on 3368 2066. The Australian Geography Competition is being run in schools around Australia and three overseas from Thursday 17 May to Thursday 31 May. All the best to all schools and students sitting the Competition. It is great to see the number of schools and students participating in the Competition on a national basis on the increase again. With RGSQ’s move to regular digital communication with schools, we have seen numbers continue to rise even since the Question Pack mailout in late April. As at 17 May there were 782 schools accounting for over 72,200 students entered. The Australian Team to the 2018 International Geography Olympiad (2018 iGeo) will be competing at Universite Laval in Quebec City, Canada from Wednesday 1 August to Sunday 5 August with the closing ceremony and medal presentation on Monday 6 August. As reported in the RGSQ’s March Bulletin, representing Australia are: Sophie Ohlin, NSW, from Sydney Girls High, Harry Hall, SA, from Trinity College (Gawler), Hannah Wright, SA, from Walford Anglican School for Girls and Phoebe Blaxill, WA, from St Mary's Anglican Girls' School, Karrinyup. The Australian Team Leaders are Kath Berg (Australian Geography Competition Committee and RGSQ member) and Liam Sloan (Geography Teachers’ Association of South Australia, 2017 and 2018 Geography’s Big Week Out Coordinator, and Geography Teacher at Endeavour College, Adelaide). More news on the 2018 iGeo closer to their departure in July. Recently, Tracey and I were fortunate to spend some time in Japan. 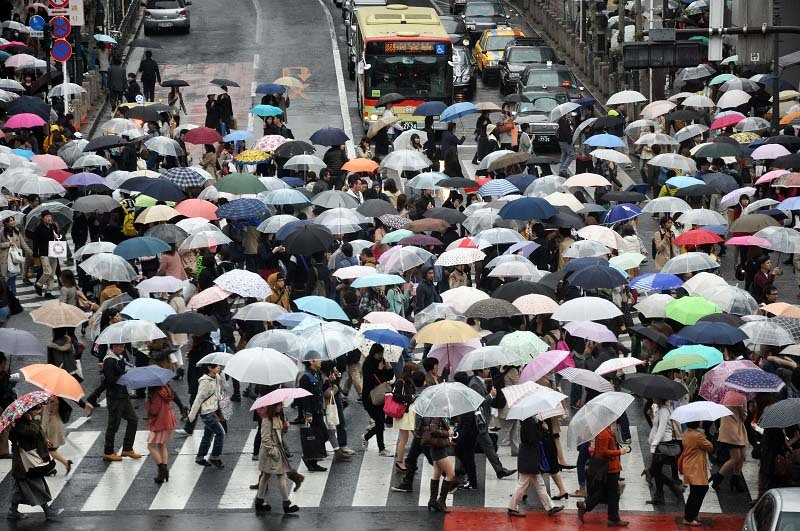 A very noticeable feature of the crowds in the streets and on the trains were those who I identified as ‘stooped’ – elderly Japanese hunched over walking frames, moving slowly along with the assistance of walking sticks or being pushed in wheelchairs. Several of our guides on day trips announced that they were officially ‘retired’ but were continuing to work in a part-time capacity. Many taxi drivers appeared to be elderly. Officials wearing blue uniforms and directing traffic were often elderly. The figures in Table 1 show currently that Japan has just over a quarter of its population aged over 65 years, the highest percentage for all countries. Globally, the country has the highest elderly dependency ratio (i.e. the number of over 65-year old citizens dependent upon 100 employed adults) and the highest median age for any national population (i.e. middle value). Japan has reached this situation due to a combination of two factors. The country, like Australia, Canada and the USA, experienced a ‘baby boom’ after World War II. The total Japanese population rose from 71.9 million (1945) to 111.9 million (1975). This trend has coincided with increased life expectancies. Today, Japan has the world’s highest life expectancy, so all those people born after 1945 have an increased chance of surviving into their eighties (or beyond). The implications for Japan are profound. To support so many elderly, the country must maintain its economic prosperity. This task will provide its leaders a challenge, especially at a time when the Japanese population is predicted to shrink from 125 million (2020) to 107 million (2050) due to the country’s very low birth rates. Current Japanese workers may have to come to terms with the idea that they will be required to work until the age of seventy (or beyond), and that they will have to pay higher taxes to support so many elderly persons. Innovative solutions to caring for so many aged, such as the use of robots, may become more common. Finally, from a global perspective, the world (and Japan) is in uncharted territory. Five hundred years ago, the life expectancy of some-one living in England was around 38-40 years of age. Currently, the world and individual countries have never had so many aged persons, and the numbers are likely to increase, especially in China where the current number of people aged over 65 is expected to rise from 123 million to 440 million by 2050. There are no trends or insights from the past to guide global leaders in formulating policies to accommodate the ‘stooped’ generation. What is probable, however, is that these elderly will not be silent and that their sheer numbers will create new political movements, demanding a greater share of national resources to care for their aged members. 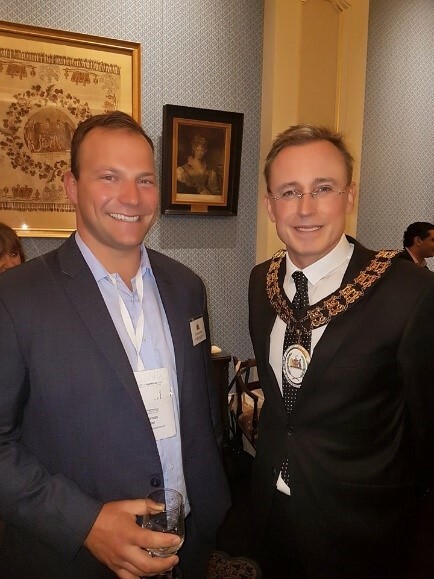 Dr. Sigler with Adelaide Lord Mayor Martin Haese, who addressed the SOAC delegation on the conference’s opening night. Courtesy of Thomas Sigler. Dr. Thomas Sigler, Senior Lecturer in Human Geography at the University of Queensland’s School of Earth and Environmental Sciences, is working on an Australian Research Council (ARC) funded project investigating the corporate Geographies of Australian cities. The geography of firm (business company) location is a longstanding focus in urban studies. Dr Sigler’s work was presented at the State of Australian Cities (SOAC) conference in Adelaide in November, 2017. Written in collaboration with Mr Ben Parker (Queensland Department of Natural Resources and Mines) and Dr Kirsten Martinus (UWA), the research has found that all major Australian cities except Melbourne lost firm headquarters (HQs) during the 2013-2016 period. A major contributing factor was the downturn in the resources sector. Cities in which mining and energy play a key role, most obviously Perth, had the greatest HQ losses, while Melbourne was the only city to gain between 2013 and 2016. The research showed that within our cities major losses in firm activity were experienced in core areas (CBDs). This was compensated to some degree by suburbs, especially inner-ring suburbs, gaining firm HQs, for example in information technology. These broad changes indicate a shift to the knowledge economy across cities in which central and CBD-fringe locations are desirable from a firm perspective. Dr. Sigler’s research was picked up by the Australian Financial Review, Dec 7 2017. Emeritus Professor Tor Hundloe of UQ’s School of Earth and Environmental Sciences, has been appointed as a member of the Environment Institute of Australia and New Zealand (EIANZ)’s Qualifications Accreditation Board (QAS) for a period of 3 years from 27 April 2018. The creation of the EIANZ-QAS is a milestone achievement in the development of the environment profession in Australia and New Zealand. The QAS will do much to encourage the development of a quality education for those choosing to enter the profession and progress in their careers. Professor Hundloe is a founding member of the EIANZ, was the inaugural President and was awarded Life Membership in 1991. He was made a Member of the Order of Australia (AM) in 2003. In 2010, he was awarded the Individual Award by the United Nations Association of Australia Associations - citation 'An Environmental Pioneer'. Dear Members, I would like to bring you up to date on some recent activities and to express some acknowledgements. The search for new RGSQ premises: We are continuing investigation of various properties. The Gregory House Committee has been very busy, working with our real estate representative, to identify suitable properties within 7km of the CBD. A BIG THANK YOU to committee members, Bob Abnett, Paul Broad, Chris Spriggs and Bernard for their efforts in this regard. From the many properties reviewed so far, RGSQ Council has inspected and seriously considered six buildings, located in Rocklea, Toowong and Milton. While the buildings were attractive in many ways, all have drawbacks of one kind or another relating to location, price, size, layout, etc. Council has considered the pros and cons of each property with a great deal of discussion. The reality is, however, that we will probably need to compromise on some aspect of a new building. Nowhere is perfect, and you will recall that the decision to sell 237 Milton Road was, in part, determined by the fact that our current building had some major problems. We are seeking the best possible option for RGSQ future requirements and will not rush into a purchase without extensive consideration and background research. I hope to have more positive news on this over the next month or so. Meanwhile, the Society will lease our current office and meeting spaces at 237 Milton Road until the end of the year if we need to do so. Monthly meetings/lectures continue on the first Tuesdays of the month at Magda Community Artz Hall. The Australian Geography Competition (AGC) has been very successful this year, with 782 schools and over 72,000 students participating across Australia, an increase from 2017. The AGC is RGSQ’s most effective activity in promoting Geography in high schools. A BIG THANK YOU to the AGC Committee for their dedication in organising the AGC, to Bernard and Lilia for coordinating the AGC and creating AGC materials and to all RGSQ volunteers who work tirelessly to pack the nearly 4 tonnes of materials into envelopes, satchels and parcels for the mail-out to schools on time. Students take part in the competition in schools from 17 to 31 May. The top male and female students in Year 11 from each State and the combined Territories, participate in the annual Geography's Big Week Out, (GBWO), a six-day event on Kangaroo Island, South Australia in early October 2018. This exercise focuses on fieldwork, spatial technologies and analytical skills, allowing selection of Australia's team for the following year’s International Geography Olympiad (iGeo). This will be held this year in early August in Quebec City, Canada. The new RGSQ website: The new Society website has been launched! Check it out at https://rgsq.org.au. A BIG THANK YOU to the website committee, Graham Rees, John Fairbairn, Ian Francis, Lilia and Bernard for the considerable time and effort that has gone into creating and setting up this much-improved website which will be a valuable portal for the Society in reaching out to members and the wider world. Among other features, the new website will allow members to look up the latest calendar of the Society’s events, activities and lectures, renew and pay annual memberships online and access a private section where every individual RGSQ member can login to see information for “members only”. To find out more, come along to the Tuesday June 5th evening meeting at the Magda Community Artz Hall for a “show and tell” presentation followed by hands-on assistance with using the new website. Members of the website committee will be available to answer questions. You are welcome to bring along your laptop to “play around” on the website at the meeting. There will be some laptops for use on the night for those who are unable to bring a device. We have much pleasure in welcoming Dr Jonathan Corcoran and Mr Matthew Dale as new members. We hope your association with your new Society is long and mutually enjoyable. On behalf of all RGSQ members, I have much pleasure in welcoming Mr Kent Olive, Miss Shannon Boyce, Miss Bonnie Wu, Miss Sienna Blanckensee, Miss Cassandra Malley, Miss Lindsey File, Mr Benjamin Priebenow, Miss Tamera Summerill, Miss Julia Marler, Miss Grace Marion Derrick, Miss Gail Gregson, Ms Jennifer Allen and Mr John Saint-Smith as new members. We hope your association with your new Society is long and mutually enjoyable.